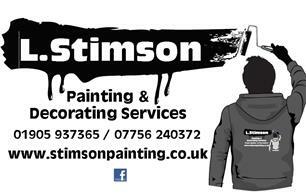 L Stimson Painting & Decorating Services - Painter/Decorator, Tiler - Tiling based in Droitwich, Worcestershire. I started on my own after moving to Droitwich a few years ago, I previously worked for my father for over 10 years who is still in the trade and been trading for over 45 years and very respected. I have worked in all areas including many manor houses so my work is very thorough and precise, I take pride in each and every job with a very skilful eye and attention to detail. I always leave each and every job exactly how it should be left which is spotless!. My reputation since starting on my own is continuing to grow rapidly and this shows that I always leave a job looking like perfection. I carry out all aspects of painting & decorating and would like to say that my speciality is wall papering. I cover internal and external painting & decorating, wall and floor tiling. We also offer airless spraying which is much quicker than a brush and roller with the perfect finish ideal for large builds ie factorys, offices, industrial units etc..
Don't hesitate to get in touch as you won't be disappointed. Please feel free to check out my facebook page! Be sure to check out my amazing Feedback!